The dog den gets an upgrade courtesy of Ooboo Designs. 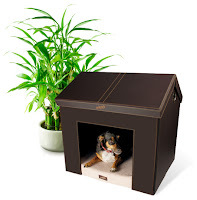 Crafted out of faux leather (for easy wipe downs), and featuring a memory foam bed, this little indoor doggy house also features innovative "attic" storage in the roof for all of Fido's personal belongings. Better yet, for those city-dwellers, the house folds down to a very manageable size. Available in 3 different sizes from Ooboo Design's website starting at $129.99.